Once I had measured up and sketched out my plan, it was off to the hardware store for a bit of lumber (and a positive attitude in tow never hurts). The shelving unit turned out really well; I gained inspiration for it from products I found online and a tutorial I found for a shoe storage cubby shelf, of which was a hack itself, so in essence, I hacked a hack (of a hack)? this post contains affiliate links for your reference and at no additional cost to you. For more information, please visit my Disclosure Statement and Advertising Policies page. Like I said above – my mom helped me to put my sewing room back together after our basement renovation. As she was re-folding all of the fabric we had hastily shoved into storage bins before the reno started, she kept mentioning how great it would be to have some sort of shelf that would fit and display all of the fabric. I went to work researching and measuring, researching and measuring. I initially wanted to put shallow 12" kitchen cabinet uppers on the wall, but was worried that even with the shallow 12" depth it wouldn't be shallow enough - that they would protrude too much, especially in my 'head space' above the workspace area of my office desk. Plus – these cabinet uppers were going to cost a fortune and I didn’t want to spend the next year saving for them. 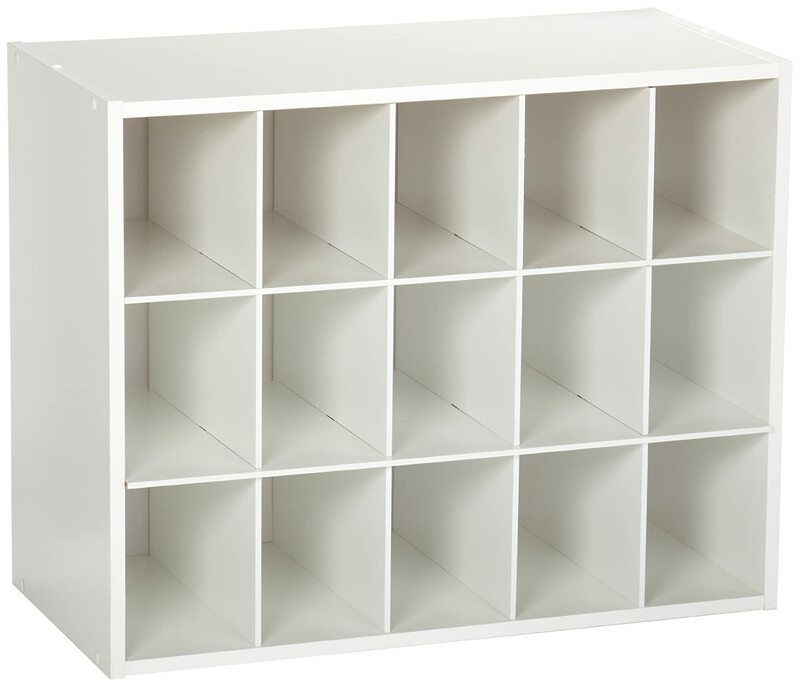 ...but I estimated that I'd need quite a few of these shelves to make a dent in the storage I needed. The numbers on the front are really cute though, right? 19.4" x 24.3" x 11.6"
but I was worried about how sturdily I would be able to attach it to the wall given that it is made of mdf, and that it is almost 12" deep so would protrude off the wall quite a bit. On the floor or up on short legs, this would be a great storage system. It'd even work well up on a desk... but for me in that space that 12” depth was the deal breaker. I would need to make something on my own. Always DIY safely (wear safety glasses!) and at your own risk. 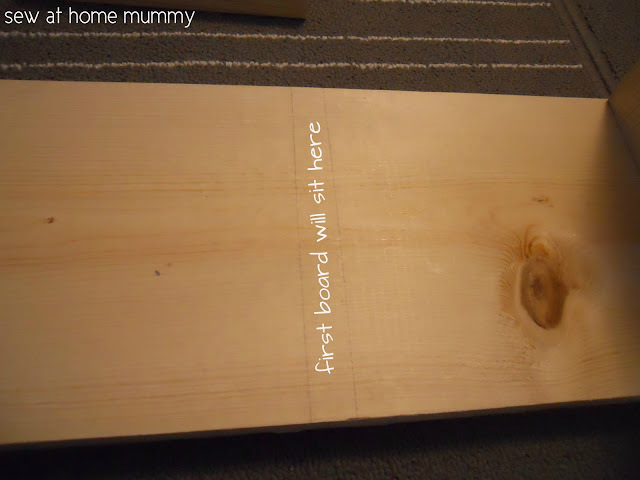 turn the bottom board on its side, apply a thin bead of wood glue on the 7" piece of divider board which will make contact with the bottom board and from the underside of the bottom board and aligning the edge of the 7" board with the mark you made, nail in place. 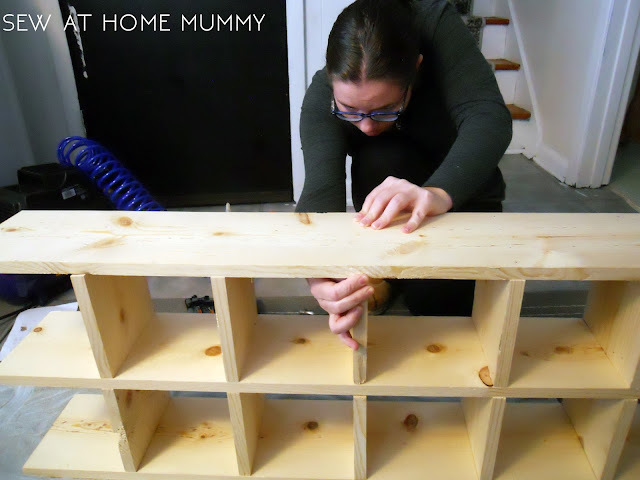 Continue nailing your first row of sides in place until all 6 first-row dividers are in place. make sure to wipe away any excess glue that seeps out from under your divider boards as you go - keep a paper towel or rag handy to wipe away the goop before it dries. 2. Apply a bead of glue to the tops of each of the divider boards you just nailed in place. Nail your next long board on, making sure to check that each side board is level before nailing through the top of the long board into the divider boards below. Ensure the long board edges are flush on either side before nailing. again placing them every 7". Make sure you keep checking that your boards are level and square with the ones below them (as much as possible - I had some warped boards so I did the best I could). 4. Keep going! Lather rinse repeat - measure out your 7", mark, bead of glue, toenail, wipe excess glue away. Repeat all the way across, repeat the process with the long boards until you're done all four rows of cubbies. 5. 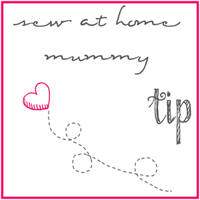 Apply your sides using the same process - beads of glue along each point of contact, then nail in place. 7) Using wood filler and caulk, fill all of the screws, knots, cracks, imperfections, and corner joints (caulk is best for these seams between the dividers and long boards; a thin coat of fill over dark knots will help paint and primer to cover the dark color better). 8) After letting your filler dry, sand to smooth, repeating the process as needed. Clean all surfaces of dust and debris with a dry cloth. 9) Apply primer and paint, or stain and sealer, according to manufacturers instructions. consider checking your local dollar store for paint supplies like foam rollers, brushes and trays. for less finicky projects like this I use cheaper painting products that I can just throw out – easier than worrying about cleaning them when I’m done! 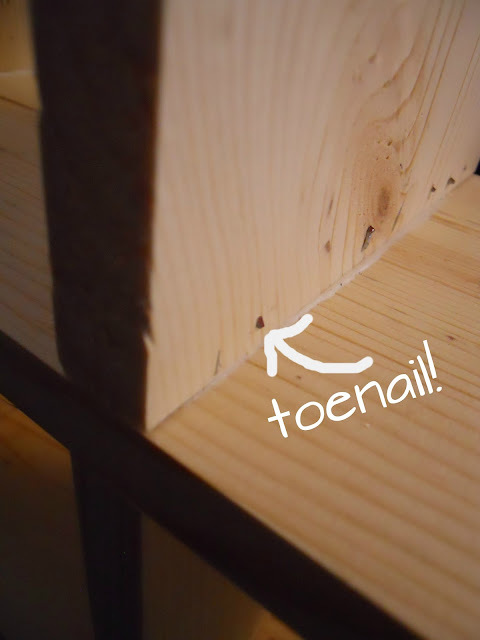 10) Apply French cleat wall hanging system according to enclosed instructions, making sure to first drill pilot holes in your self unit before screwing nails to ensure the wood doesn’t split. make sure to pre-drill pilot holes slightly smaller than the screws you'll use before attaching the French cleat! 12) You’ll notice because I have an open back on the shelf you can see the French cleat – easily hidden with a strategically placed fat quarter bundle! I’d love to see pictures of your fat quarter storage in the comments – what do you use? and if you make this project, make sure to leave a comment with a picture or a link to a photo of yours, I’d love to see it. Thanks for the info on how you built your fabric cubbies. I am also trying to make cubbies for my fat quarters and also some larger cubbies to hold my batting and interfacings. You gave great instructions that will help me with my project too! This is amazing and so simple! We are going to use this to display our Pop! collection! book shelves were getting to expensive and hate that you can't see the stuff on the floor. Will probably mount this above our couch and then make a smaller one for above our entertainment center! Well done, well explained. very inspiring!! Awesome storage idea and this blog post is most excellent! Thank you for the exact directions! Do you know approximately how much it cost you for the supplies to make this project? Great tutorial, by the way. I'm definitely considering making one. Just wondering about the price. Thanks! Hi! Do you know approximately how much it cost you to buy the supplies for this project? It's a great tutorial and I think I'd like to build one (a larger one to store regular fabric) and I just want to know if it's something I can afford to do right now. Thanks so much! I so want to thank you for the this how to xoxo as my mom and grandma would say girl power!I have been sewing crocheting knitting drawing anyting to create some type of Art since I was 5 got my first sewing machine it was a little girls for Christmas and it was broke right out of the box and I was moved up to the big girl Machine by Sears and robot and along with sewing lessons I am a young Nana to three at 51 and can't wait to see the creative things that my granddaughter and grandson's come up with.